Somerset County is a great place for cyclists to enjoy scenic rides. Some of these rides include bicycle tours from the New Jersey Department of Transportation (NJ DOT). 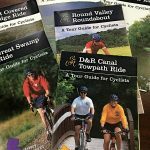 Bike through the Great Swamp, visit New Jersey’s last covered bridge, or ride along the Delaware & Raritan Canal Towpath. Below are interactive maps for NJ DOT rides located in and near Somerset County. Each individual ride map includes destinations along the ride, such as spots to eat, parks, historic sites, and more. Each map also includes a link where you can download a .GPX file and turn-by-turn directions for the route. The East Coast Greenway is a 3,000 mile trail system linking 25 major cities from Maine to Florida. In New Jersey, the ECG runs 78 miles between Pennsylvania and New York, passing through major urban areas – Trenton, Princeton, New Brunswick, Newark, and Jersey City – as well as rural and suburban communities. The Great Swamp Tour consists of two loops passing through and around the Great Swamp National Wildlife Refuge. The routes feature some hills and only moderate traffic volumes, at least during non-peak weekday hours. The wildlife area is surrounded by residential development. Because of this, bicyclists must be prepared to share the road with motor vehicle traffic. The High Point to Cape May Bicycle Route offers both breathtaking scenery and connections to major destinations. Cyclists may choose to either ride the entire 238 miles of the route or travel along shorter segments over several days. Last Covered Bridge Ride offers three different routes that will take you by Green Sergeant’s Covered Bridge, New Jersey’s last remaining covered bridge. The routes are hilly (especially the long loop) and for the most part wind along rural roads with low traffic. If you’re tackling the moderately hilly 28.6-mile circuit tour of the Round Valley Roundabout during a hot summer day, it can be reassuring to know that the clear blue water of the Round Valley Reservoir is almost always in view. The Roundabout circumnavigates the Round Valley Reservoir and some of its outlying areas. If you’re seeking cycling tours with a lower degree of difficulty, consider any of these three river rides. These routes meander along scenic, relatively low traffic roads with few if any hills. In fact, multispeed bicycles are not a necessity.